This chapter of the profile is a health effects summary written in nontechnical language. Its intended audience is the general public especially people living in the vicinity of a hazardous waste site or substance release. If the Public Health Statement were removed from the rest of the document, it would still communicate to the lay public essential information about the substance. The major headings in the Public Health Statement are useful to find specific topics of concern. The topics are written in a question and answer format. The answer to each question includes a sentence that will direct the reader to chapters in the profile that will provide more information on the given topic. Tables (2-1, 2-2. and 2-3) and figures (2-1 and 2-2) are used to summarize health effects by duration of exposure and end point and to illustrate graphically levels of exposure associated with those effects. All entries in these tables and figures represent studies that provide reliable, quantitative estimates of No- Observed-Adverse-Effect Levels (NOAELs), Lowest-Observed-Adverse-Effect Levels (LOAELs) for Less Serious and Serious health effects, or Cancer Effect Levels (CELs). In addition, these tables and figures illustrate differences in response by species, Minimal Risk Levels (MRLs) to humans for noncancer end points, and EPA's estimated range associated with an upper-bound individual lifetime cancer risk of 1 in 10,000 to 1 in 10,000,000. The LSE tables and figures can be used for a quick review of the health effects and to locate data for a specific exposure scenario. The LSE tables and figures should always be used in conjunction with the text. (1).Route of Exposure One of the first considerations when reviewing the toxicity of a substance using these tables and figures should be the relevant and appropriate route of exposure. When sufficient data exist, three LSE table and two LSE figures are presented in the document. 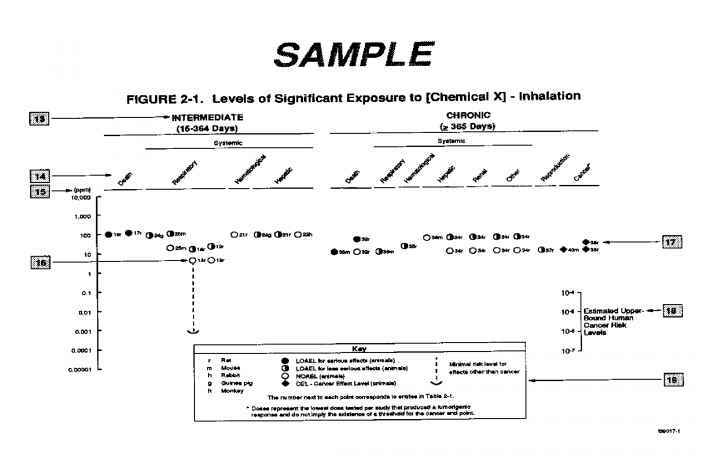 The three LSE tables present data on the three principal routes of exposure, i.e., inhalation, oral, and dermal (LSE Table 2-1, 2-2, and 2-3, respectively). LSE figures are limited to the inhalation (LSE Figure 2-1) and oral (LSE Figure 2-2) routes. (2).Exposure Duration Three exposure periods: acute (14 days or less); intermediate (15 days to 364 days); and chronic (365 days or more) and presented within each route of exposure. In this example, an inhalation study of intermediate duration exposure is reported. (3).Health Effect The major categories of health effects included in LSE tables and figures are death, systemic, immunological, neurological, developmental, reproductive, and cancer. 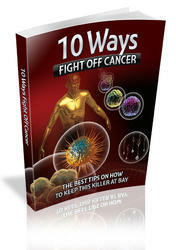 NOAELs and LOAELs can be reported in the tables and figures for all effects but cancer. Systemic effects are further defined in the "System" column of the LSE table. (4).Key to Figure Each key number in the LSE table links study information to one or more data points using the same key number in the corresponding LSE figure. In this example, the study represented by key number 18 has been used to define a NOAEL and a Less Serious LOAEL (also see the two "18r" data points in Figure 2-1). (5).Species The test species, whether animal or human, are identified in this column. (6).Exposure Frequency/Duration The duration of the study and the weekly and daily exposure regimen are provided in this column. This permits comparison of NOAELs and LOAELs from different studies. In this case (key number 18). rats were exposed to [substance x] via inhalation for 13 weeks, 5 days per week, for 6 hours per day. (7).System This column further defines the systemic effects. These systems include: respiratory, cardiovascular, gastrointestinal, hematological, musculoskeletal, hepatic, renal, and dermal/ocular. "other" refers to any systemic effect (e.g. a decrease in body weight) not covered in these systems. In the example of key number 18, one systemic effect (respiratory) was investigated in this study. (8).NOAEL A No-Observed-Adverse-Effect Level (NOAEL) is the highest exposure level at which no harmful effects were seen in the organ system studied. 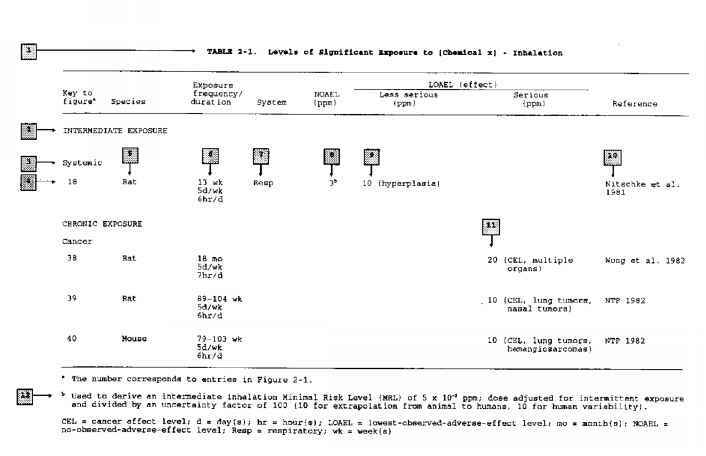 Key number 18 reports a NOAEL of 3 ppm for the respiratory system which was used to derive an intermediate exposure, inhalation MRL of 0.005 ppm (see footnote "b"). (9).LOAEL A Lowest-Observed-Adverse-Effect Level (LOAEL) is the lowest exposure level used in the study that caused a harmful health effect. LOAELs have been classified into "Less Serious" and "Serious" effects. These distinctions help readers identify the levels of exposure at which adverse health effects first appear and the gradation of effects with increasing dose. a brief description of the specific end point used to quantify the adverse effect accompanies the LOAEL. The "Less Serious" respiratory effect reported in key number 18 (hyperplasia) occurred at a LOAEL of 10 ppm. (10).Reference The complete reference citation is given in Chapter 8 of the profile. (11).CEL A Cancer Effect Level (CEL) is the lowest exposure level associated with the onset of carcinogenesis in experimental or epidemiological studies. CELs are always considered serious effects. The LSE tables and figures do not contain NOAELs for cancer, but the text may report doses which did not cause a measurable increase in cancer. (12).Footnotes explanations of abbreviations or reference notes for data in the LSE tables are found in the footnotes. Footnote "b" indicates the NOAEL of 3 ppm in key number 18 was used to derive an MRL of 0.005 ppm. LSE figures graphically illustrate the data presented in the corresponding LSE tables. Figures help the reader quickly compare health effects according to exposure levels for particular exposure duration. (13).Exposure Duration The same exposure periods appear as in the LSE table. In this example, health effects observed within the intermediate and chronic exposure periods are illustrated. (14).Health Effect These are the categories of health effects for which reliable quantitative data exist. The same health effects appear in the LSE table. (15).Levels of Exposure Exposure levels for each health effect in the LSE tables are graphically displayed in the LSE figures. Exposure levels are reported on the log scale "y" axis. Inhalation exposure is reported in mg/m or ppm and oral exposure is reported in mg/kg/day. (16).NOAEL In this example, 18r NOAEL is the critical end point for which an intermediate inhalation exposure MRL is based. As you can see from the LSE figure key, the open-circle symbol indicates a NOAEL for the test species (rat). The key number 18 corresponds to the entry in the LSE table. The dashed descending arrow indicates the extrapolation from the exposure level of 3 ppm (see entry 18 in the Table) to the MRL of 0.005 ppm (see footnote "b" in the LSE table). (17).CEL Key number 38r is one of three studies for which Cancer Effect Levels (CELs) were derived. The diamond symbol refers to a CEL for the test species (rat). The number 38 corresponds to the entry in the LSE table). (18).Estimated Upper-Bound Human Cancer Risk Levels This is the range associated with the upper-bound for lifetime cancer risk of 1 in 10,000 to 1 in 10,000,000. These risk levels are derived from EPA's Human Health Assessment Group's upper-bound estimates of the slope of the cancer dose response curve at low dose levels (q1). (19).Key to LSE Figure The Key explains the abbreviations and symbols used in the figure. The Relevance to Public Health section provides a health effects summary based on evaluations of existing toxicological, epidemiological, and toxicokinetic information. This summary is designed to present interpretive, weight-of-evidence discussions for human health end points by addressing the following questions. 1. What effects are known to occur in humans? 2. What effects observed in animals are likely to be of concern to humans? 3. What exposure conditions are likely to be of concern to humans, especially around hazardous waste sites? The section discusses health effects by end point. Human data are presented first, then animal data. Both are organized by route of exposure (inhalation, oral, and dermal) and by duration (acute, intermediate, and chronic). In vitro data and data from parenteral routes (intramuscular, intravenous, subcutaneous, etc) are also considered in this section. If data are located in the scientific literature, a table of genotoxicity information is included. The carcinogenic potential of the profiled substance is qualitatively evaluated, when appropriate, using existing toxicokinetic, genotoxic, and carcinogenic data. ATSDR does not currently assess cancer potency of perform cancer risk assessments. MRLs for noncancer end points if derived, and the end points from which they were derived are indicated and discussed in the appropriate sections(s). Limitations to existing scientific literature that prevent a satisfactory evaluation of the relevance to public health are identified in the Identification of Data Needs section. Where sufficient toxicologic information was available, MRLs were derived. MRLs are specific for route (inhalation or oral) and duration (acute, intermediate, or chronic) of exposure. Ideally, MRLs can be derived from all six exposure scenarios (e.g., Inhalation - acute, -intermediate, -chronic; Oral - acute, -intermediate, - chronic). These MRLs are not meant to support regulatory action, but to acquaint health professionals with exposure levels at which adverse health effects are not expected to occur in humans. They should help physicians and public health officials determine the safety of a community living near a substance emission, given the concentration of a contaminant in air or the estimated daily dose received via food or water. MRLs are based largely on toxicological studies in animals and on reports of human occupational exposure. MRL users should be familiar with the toxicological information on which the number is based. Section 2.4, "Relevance to Public Health," contains basic information known about the substance. Other sections such as 2.6, "Interactions with Other Chemicals" and 2.7, "Populations that are Unusually Susceptible" provide important supplemental information. 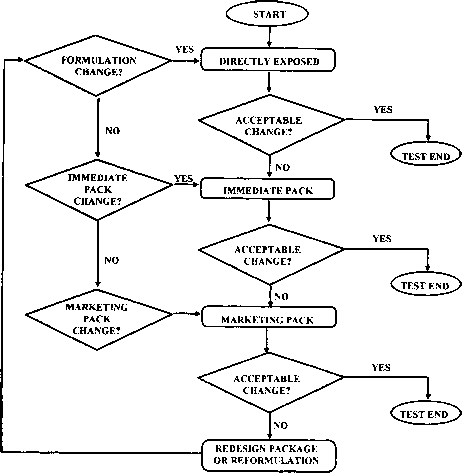 MRL users should also understand the MRL derivation methodology. MRLs are derived using a modified version of the risk assessment methodology used by the Environmental Protection Agency (EPA) (Barnes and Dourson 1988; EPA 1989a) to derive reference doses (RfDs) for lifetime exposure. To derive an MRL, ATSDR generally selects the end point which, in its best judgement, represents the most sensitive human health effect for a given exposure route and duration. ATSDR cannot make this judgement or derive an MRL unless information (quantitative or qualitative) is available for all potential effects (e.g., systemic, neurological, and developmental). In order to compare NOAELs and LOAELs for specific end points, all inhalation exposure levels are adjusted for 24hr exposures and all intermittent exposures for inhalation and oral routes of intermediate and chronic duration are adjusted for continuous exposure (i.e., 7 days/week). If the information and reliable quantitative data on the chosen end point are available, ATSDR derives an MRL using the most sensitive species (when information from multiple species is available) with the highest NOAEL that does not exceed any adverse effect levels. The NOAEL is the most suitable end point for deriving an MRL. When a NOAEL is not available, a Less Serious LOAEL can be used to derive an MRL, and an uncertainty factor of (1, 3, or 10) is employed. MRLs are not derived from Serious LOAELs. Additional uncertainty factors of (1, 3, or 10) are used for human variability to protect sensitive subpopulations (people who are most susceptible to the health effects caused by the substance) and (1, 3, or 10) are used for interspecies variability (extrapolation from animals to humans). In deriving an MRL, these individual MRL workgroup reserves the right to use uncertainty factors of (1, 3, or 10) based on scientific judgement. The product is then divided into the adjusted inhalation concentration or oral dosage selected from the study. Uncertainty factors used in developing a substance-specific MRL are provided in the footnotes of the LSE Tables.